Trivia is a weird timewaster; it basically boils down to having a chance at putting that otherwise useless factoid you learned in high school history class to good use. (As a local quiz bowl alumnus, I can attest to this fact wholeheartedly.) However, that doesn’t stop the concept from being oddly enjoyable, with some of the best experiences revolving around displaying your random knowledge against your friends. Single-player trivia experiences are somewhat disappointing by comparison, as it’s basically you against the virtual ether with not a lot going on. However, Majotori has jumped in to fill the void of single-player trivia games by providing a lighthearted adventure twist to the formula. 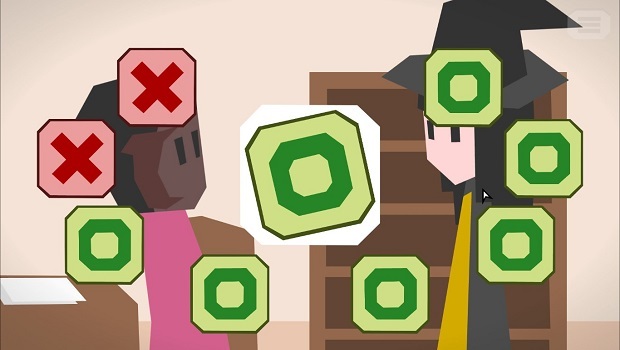 Masquerading as a visual novel “choose your own adventure” game, Majotori lets you take control of dozens of characters who all have one thing in common: at a critical juncture in their lives, a witch named Lariat swoops in and tells them to make a deal with her. If they win a game of trivia, she will make their wishes come true, but if not, something ominous will happen. You don’t exactly know why she’s in the center of attention until the end, but hey, trivia! It’s here that you’re treated to a round of ten multiple choice trivia questions; answer at least one correctly, and you’ll spin a wheel with success based on how many questions you got right. Depending on whether you land on a green or red space, the story will have a happy or bad ending. Many characters have multiple segments, so you’ll be seeing some familiar faces as you continue on in the game. You’re given a choice of a few characters whose stories you can continue as you progress through answering questions, with new characters introduced constantly. While most trivia games pride themselves on being extremely specific about questions, Majotori aims to be a more casual experience à la Trivia Crack. The four categories that are featured among the 1,000+ question bank revolve around anime, cinema, gaming, and miscellaneous information, and they can be filtered to appear more or less often depending on your preferences. While more than a thousand questions sounds a bit comprehensive, I noticed that I would get either repeating ones or different ones of the same work (for example, Attack on Titan or Undertale was referenced in two or three questions, while more obscure works were only given one). Considering that I finished a thirty-round playthrough in a little over an hour, questions can get stale after multiple playthroughs. I hope that this game will get updated here and there with more questions in the future, but for now, the bank feels a tad limited for something that’s wholly based on the mechanic. Insert Siivagunner “SNOW HALATION” joke here. The questions themselves are straightforward, with most of them asking which answer doesn’t belong to a given work of fiction or the basic plot thread of a work. The questions are not so deep as to be overwhelming, but some of them are obscure enough that you feel a bit accomplished once you get one right. While the game does center around the nerdier topics (I noticed more anime and gaming questions in my playthrough), the questions are a little bit on the well known side of pop culture. Additionally, there will be some questions that test out general knowledge, so you can’t get by on geeky things alone. This is a game that asks you to figure out the plot twist to Psycho in the same round of asking which ocean is west of a given country. They’re accessible enough that anyone can chime in and contribute an answer, and you won’t feel too out of place if you get a few wrong. The new episode of Boruto looks nice. While the questions are decently well-rounded, the multiple story threads are simultaneously Majotori’s greatest strength and weakness. I commend the fact that there are tons of characters from which to choose, ranging from a gamer who wants to make money through let’s play videos to an assassin who needs a costume for a Halloween party. These scenarios are quick, lighthearted, and don’t take themselves too seriously for the most part. Most of them are tongue-in-cheek (one of the storylines being ripped straight out of Sword Art Online). The character designs are surprisingly unique for an art style that’s 2D minimalistic like Reigns. However, with the deluge of character arcs, there are way too many to keep track. Additionally, while most of them do have branching story paths, quite a few of them are one-shots, which means you unfortunately don’t get to delve into the characters as much as you’d like. It doesn’t help that almost every character is flat in their characterization, so even if someone does die, you feel less distraught and more annoyed that you got screwed by the wheel of chance. By the middle of my first playthrough, I was less invested in the character storylines and more interested in the questions themselves, so the colorful and minimalistic presentation ends up being squandered in the long run. One of the more interesting storylines, but it’s over too quickly. The luck and chance elements, combined with an autosave feature (which will save the outcome of a story path, locking you in regardless of what happens), encourages further replays, but I would’ve rather had a new game plus feature at the end where you can just replay each character’s story at will. Because of the scattered narratives, it would have been better to have certain characters selectable at any time, and completing those stories would grant more to open up. The success roulette also feels a bit shoehorned in at times, since unless you have a perfect score on a round, you’re at the mercy at whether the computer feels like giving you a pass. This is present in the form of moving the wheel backwards at an inopportune moment (which the game even rewards with an achievement for doing so). Why should I make a fourth wall breaking comment in this caption? Majotori has some very good ideas with how to handle a unique trivia game, but unfortunately botches them in execution. While it’s good for a playthrough or two, in the end you’ll feel a bit disappointed at the whole affair.